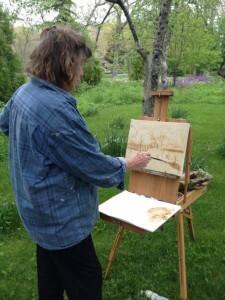 Kanta Lipsky has painted in plein air on Martha’s Vineyard for ten years. During this time she has organized and displayed her work in many plein air art shows. She holds a Master’s Degree in Expressive Therapy and Holistic Studies from Lesley University and loves encouraging art in all forms and supporting art and artists. For her, art is an extension of her spirituality, love for nature and enjoyment of people. Kanta’s background in massage began in 1978 in Santa Cruz, Ca., literally at the feet of her spiritual teacher. Since then she has studied, taught and practiced a variety of forms of healing. These include Deep Tissue massage, Pranic Healing and Polarity Therapy, both of which are aimed at clearing and balancing the body’s energy, as well as Shiatsu, or, Japanese acupressure. Kanta is a Yoga and Tai Chi teacher, and is also a Reiki master. Kanta taught Introductory Massage and Massage for Couples for many years at Interface in Watertown, MA (of blessed memory). She was also adjunct faculty at Lesley College teaching a course on Yoga and Therapeutic Touch. Kanta has continued her massage practice over the years and currently has an office in West Tisbury, MA. Kanta Lipsky began studying and meditating with her spiritual teacher, Shri Dhyanyogi Madhusudandas, over 30 years ago. Guruji, as he was called, taught Kanta the ancient practices of chanting mantras, meditation and pranayama. These days she maintains her connection with the chanting of mantras through being a leader of a call and response Kirtan group. Kanta became a Kripalu certified yoga teacher in 2000 and has been teaching regularly since then. In 2002 she founded the first yoga studio on Martha’s Vineyard along with several other teachers, called M.V. Yoga. Kanta loves how yoga makes your body feel and, at the same time, she appreciates how it can be a path to self awareness and spiritual depth. Be sure to find out about Kanta’s upcoming events and exhibits by joining her email list below.